Representatives from forestry groups, farming unions and landowners associations arrive at Holyrood this afternoon for crisis talks on how to stem the spread of Ash Dieback. In Eyemouth, it has affected mature trees in the wild. 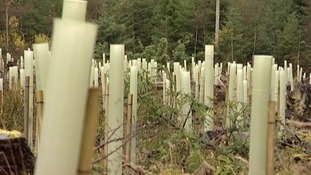 In Dalbeattie Town Wood around 4000 saplings have been infected. A summit is to be held at Holyrood to discuss the best way of controlling the spread of Chalara ash dieback. The disease has already devastated thousands of the UK's ash trees, has now been confirmed in 14 different areas across Scotland. Forestry, farming and environmental organisations will meet for the summit next week. Saplings that have been recently planted near to Castle Douglas could have to be destroyed because some have signs of the fungal disease Ash Die Back. The disease is threatening Britain's ash trees, it has already destroyed more than 90% of Ash trees in parts of Denmark. A disease threatening the future of ash trees has been found in seven sites in Scotland. 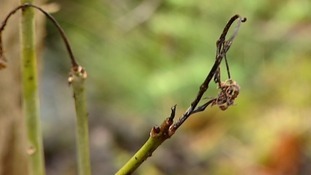 The Forestry Commission Scotland carried out a survey to measure the spread of chalara dieback. It five infected sites including Castle Douglas in Dumfries and Galloway and Eyemouth in the Scottish Borders. Chalara dieback is threatening to wipe out most of the UK's ash trees and has already killed up to 90% of ash trees in areas of Denmark. "To establish the extent of the disease, Forestry Commission Scotland has been carrying out a rapid survey involving inspecting 2,730 ash sites across Scotland. Action is also under way to trace the destination of plants sent out from potentially infected nurseries. "Only 5% of the sites visited in the rapid survey showed any potential symptoms meriting more detailed investigations and subsequent laboratory analysis and this work is ongoing. "In addition to the two sites already confirmed, a further five sites have so far been confirmed as being infected, bringing the total known confirmed cases to seven in Scotland. "Further surveys, including more detailed surveys in areas around infected sites, will be needed before we can be confident about the full extent of the disease in Scotland. There is also the possibility of windborne spread of the disease from the continent and from infected sites elsewhere in these isles." The Forestry Commission said the disease only spreads in summer so there is now an opportunity to take action. There is no risk to humans or animals and no need to restrict public access to woodlands. "Around 30% of our woodland trees are ash and it hosts lots of insects, non-damaging fungus and of course birds and bats nest in it so it is very, very important ecologically and environmentally. "The disease spreads through spores that appear on leaves or young twigs that have died. The fungus is in the leaf stock over winter and when it warms up in spring it produces these little spores - small discs - that are blown around and if they land on suitable tissue they will infect the tree."